Prime Minister Benjamin Netanyahu expresses his deep sorrow over the passing of Rabbi Yosef Shalom Elyashiv among the most important Torah leaders of our generation. “In his rulings, Rabbi Elyashiv made a deep impression on the ultra-orthodox world and on the entire Jewish People. In his teachings, he outlined a path for many, who drew their strength from his wisdom and his sharp thinking. Rabbi Elyashiv’s way was to love the Torah and humanity, to be self-effacing and to maintain the sanctity of life. For the first time after six years, Gilad Shalit will sit down with his family for the traditional Passover seder on Friday. The Shalit family had previously refrained from celebrating the Jewish holiday as long as Gilad was still held captive by Hamas. “This year we feel true freedom,” Noam Shalit, father of the former captive soldier, told Ynet on Thursday. During Gilad’s time in captivity, Shalit campaign activists staged Passover seders outside Prime Minister Benjamin Netanyahu‘s home in Jerusalem. In 2011, the Shalit family spent the seder in Jerusalem by chaining themselves to the PM’s Residence compound, while many Israeli citizens left an empty chair for Gilad at their seder table. According to Noam Shalit, this year the festivities will truly be rejoiceful and include the extended family, as Gilad’s grandparents, aunts, uncles and cousins will all join them for Passover. “We’re preparing just like any other home in Israel,” he added. Despite many attempts made by rabbis and different organizations over the years, Gilad never received any of the Passover packages his family made for him during his time in captivity. “He only knew about the holiday from what he heard on the radio, but he never received matzah or wine to prepare a Passover seder,” Noam explained. The Shalit family received a special Haggadah for the upcoming holiday, which includes photographs of Gilad from his IDF service, from the day he was released from Hamas captivity and pictures from the campaign to free him. 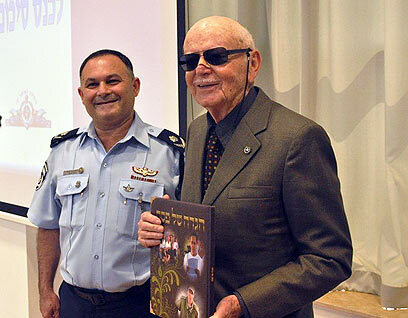 The Haggadah was given to Gilad’s grandfather, Zvi Shalit, by Police Operations Division Chief Nissim Mor.